Selected for CBC's "Canada Writes" 2013 Long List! SYDNEY — A Cape Breton writer has made the long list for the 2013 CBC Short Story Prize. “Prophets Don’t Honk” by Larry Gibbons of Middle River in Victoria County, is one of 32 titles on the long list and the only Atlantic Canadian selection. Thousands of submissions were received for this year’s competition, run by CBC Radio and partners, the Canada Council for the Arts, Air Canada’s enRoute magazine, and The Banff Centre. White Eyes, a new collection of short stories from Breton Books, offers a look into a unique slice of Cape Breton life. It will be launched today at 7:00 p.m. at the MacConnell Library in Sydney. 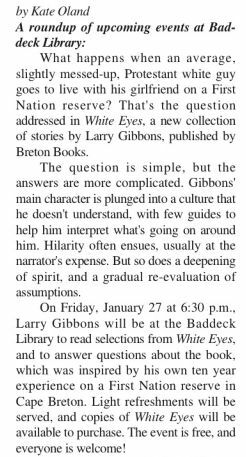 Author Larry Gibbons drew on his experience as a white man who fell in love with a Mi’kmaq woman and lived on a reservation in Cape Breton for ten years. He pointed out that Gibbons went to the First Nations community not as a researcher or a social worker, but simply as a person. Reserve life showed Gibbons a new world that challenged his own values and opened rare possibilities. Author Sheldon Currie has described the book as full of “wonderful stories – funny warm and sensitive” about “a clash of cultures.” As a white man, Gibbons often had what noted Mi’kmaq linguist Bernie Francis calls “a helluva time understanding reserve life.” The 16 stories in White Eyes take the reader on a journey that Caplan said is “respectful, compassionate, often comic and absolutely unique. This was published in Kate Oland’s BOOK NOOK column in The Victoria Standard, Jan. 23-Feb. 5, 2012. Kate is the librarian of the Baddeck Branch of the Cape Breton Regional Library. Kate provides an abundance of remarkable support to local authors. She organizes writing groups and encourages the writers in them. She provides a warm, welcoming space for authors’ readings and book signings, which, of course, she also publicizes in the local paper. She also manages to produce oat cakes and tea for these events. And needless to say, she makes sure that all books by local authors are on the library shelves. Kate is a gem. Most everybody in this area knows that. It is possible that not everyone realizes that she is also an amazing singer, but if they didn’t know before, they do now. She demonstrated that talent this month, when she and Bill Conall sang together at a concert held in Baddeck to raise funds for the local hospice.